Our well rounded multidisciplinary team includes a School Psychologist, who is able to complete any psychoeducational assessments that may be required, whether as part of a triennial IEP or when we wish to develop a more complete picture of the learning style of students who are new to our program. Understanding how our students distinctively process information allows us to maximize their potential by tailoring our educational program so that each student is taught in the way that they learn best. 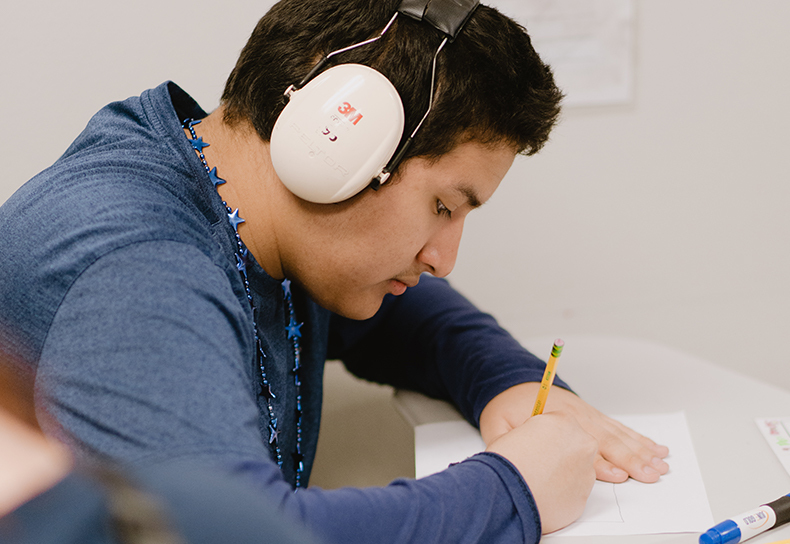 Our School Psychologist utilizes a variety of tools, including verbal and nonverbal measures and parent rating scales to ensure that we have a complete picture of our students that incorporate their functioning at home and in the community. Because our School Psychologist is a familiar face on campus, the rapport that has already been developed can be harnessed to ensure that students perform to the best of their ability and educational decisions are made with the most accurate data possible. Additionally, having a School Psychologist on site allows unfettered access to our students across settings, creating opportunities for frequent observations during structured and unstructured activities and allowing for a greater level of ecological validity throughout the assessment process. Perhaps most importantly, allowing our School Psychologist to assess our students gives us an opportunity to ensure that further consultation regarding student learning is available and recommendations for student growth are adhered to across school settings. See our flyer on these services.